If you’re a child of the 80’s, the title of this review has now given you an earworm in the form of the old commercial for Monchichi dolls. Please don’t kill me. Like Machi Koro, the Monchichi’s were another Japanese import, but that’s where any similarity ends. 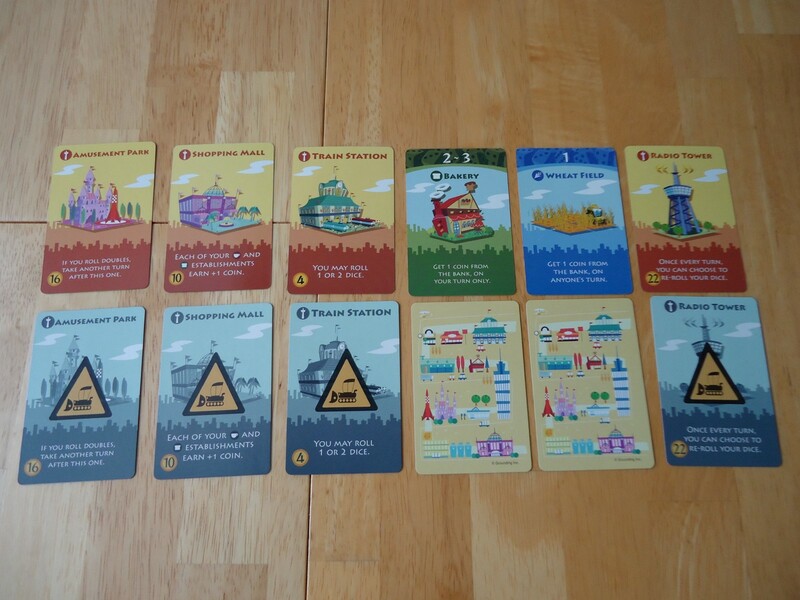 Machi Koro is a fast playing, card-based city building game, not a monkey doll. They both have cute names, though, so enjoy that earworm while you play. You’re welcome. 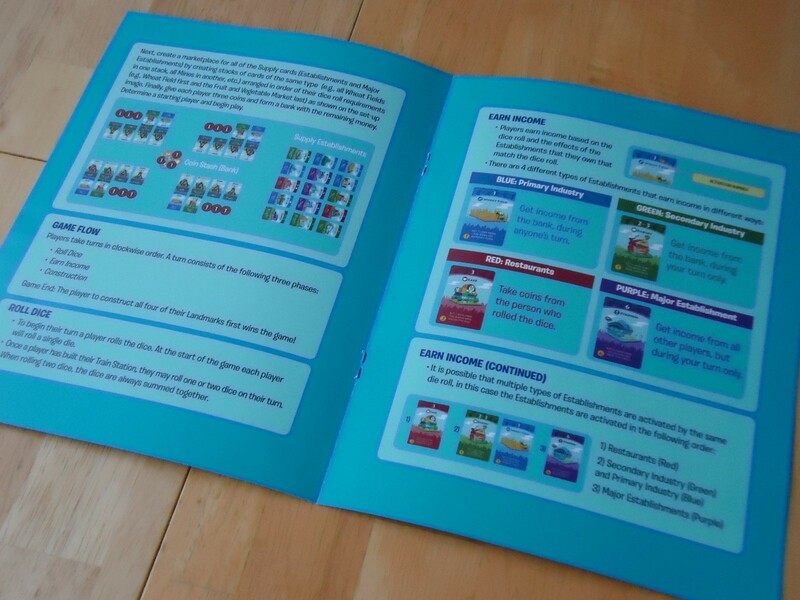 Machi Koro is a light card game and in it, you are the mayor of Machi Koro. Your job is to make your city the largest in the region. 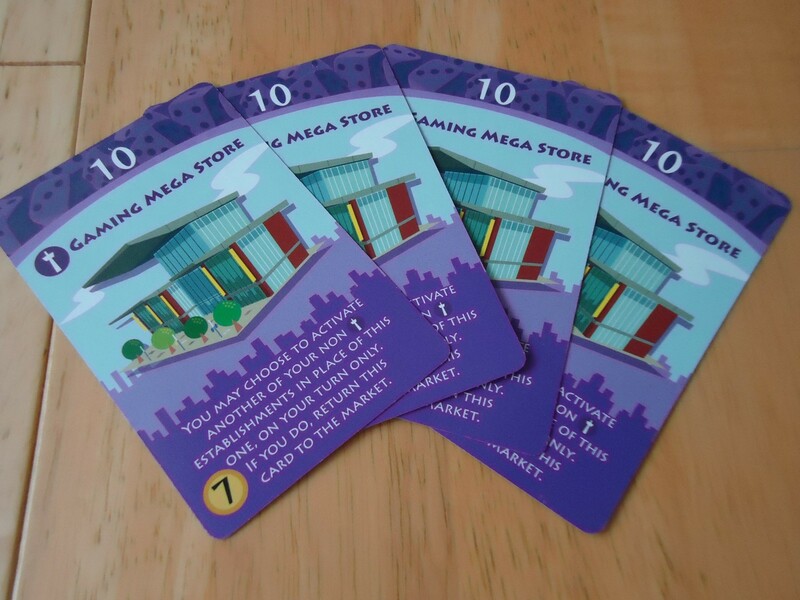 You will use your cards and dice to build buildings, collect income, and install public works. Succeed and your citizens will love you and probably build a statue in your honor. Fail and they’ll probably all move into the winner’s awesome city leaving you with nothing to be mayor of. The supply of available Establishments (“The Marketplace”) is set up in reach of all players. All cards of the same type are stacked together and the individual stacks are laid out on the table in order of their dice roll requirements. The rule book is easy to read and short. Players take turns in clockwise order A turn consists of three phases, each of which is summarized below. Roll Dice: You roll the dice at the beginning of your turn. At the start of the game, you will only roll one die. After you have built your train station, you may choose whether to roll one or two dice on your turn. If you opt to roll two dice, you must sum the dice together. You may not choose to use just the number from one die. Earn Income: You earn income based on the combination of the dice roll and any Establishments that you own that match that dice roll. Each type of Establishment earns income in different ways. Some get income directly from the bank on anyone’s turn, others get income from the bank only on your turn, and some require you to take your income from other players (or for them to take money from you). It is possible that you will earn or lose income from multiple establishments on one turn. If you own multiple copies of one establishment, any income or loss is multiplied by however many copes of that establishment you own. Construction: At the end of your turn, you may pay to build one Establishment or finish construction on one Landmark by paying the cost shown in the lower left corner of the card. An Establishment is purchased from the Marketplace and is placed in your play area right side up. A completed Landmark is simply turned over to its full-color side. All effects of completed construction are in effect immediately. You may construct multiple copies of most Establishments, but only one of each type of Major Establishment may be constructed. The first player to construct all four of their Landmarks is the winner. Mucho Machi or I’d Rather Play With That Monchichi You Mentioned? Machi Koro is one of those games that, on the surface, doesn’t look like it should be much fun. You’re rolling dice and playing cards. What’s so fun about that? A hundred games do that already. 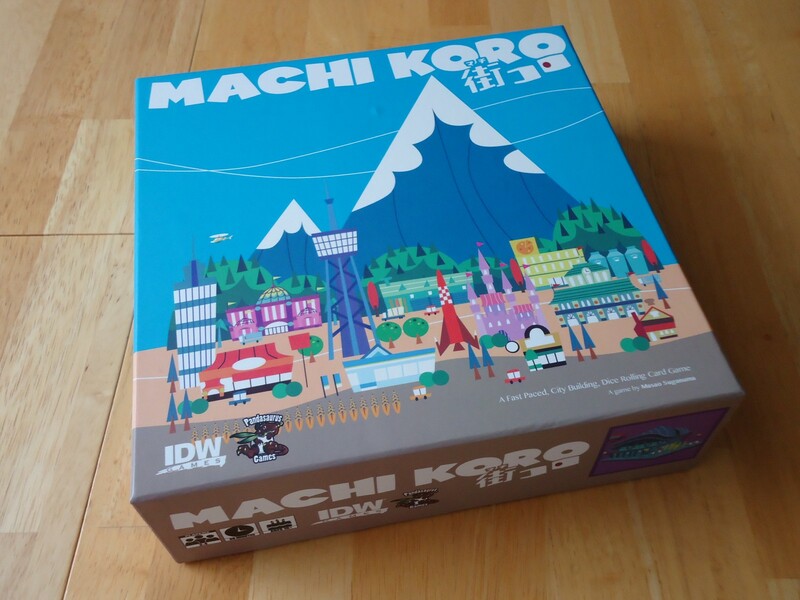 What Machi Koro does well is to mix several types of games and strategies into one very simple to learn and quick game. 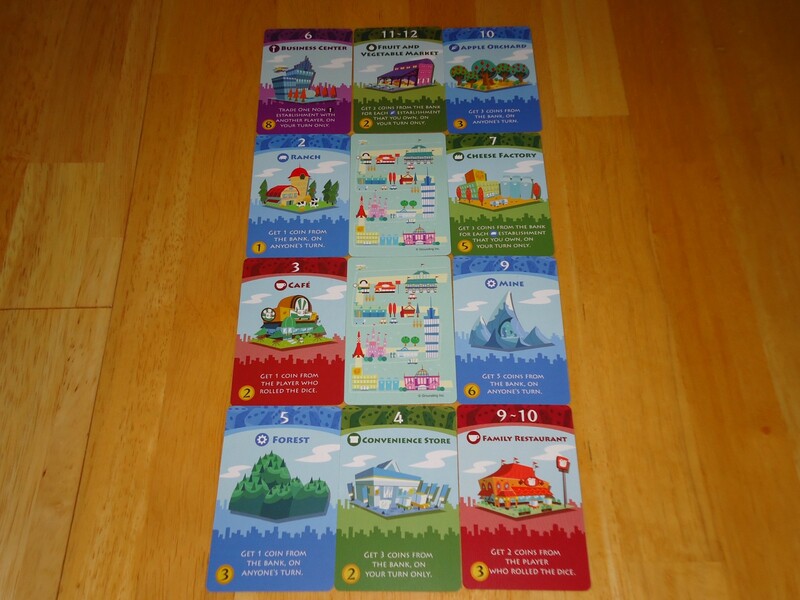 At it’s heart, Machi Koro is an engine building game. You are trying to buy cards that will earn you enough income so that you can buy more cards. You need to create a high performing engine so that your income grows every turn and you can snowball your way to victory. It’s a bit like Dominion in this way. But there’s more. It’s also a bit like Monopoly in that you’re rolling dice, earning/losing money based on what you roll, and then having the chance to buy more properties that will help you later in the game. (In fact, I’ve found Machi Koro to be a great lure to get Monopoly lovers to try a different game.) Just like in Monopoly, you’re rooting for a die roll that won’t hurt you but will hurt someone else. Unlike Monopoly, however, you get more say in which properties you acquire. All of the Establishments are available at the beginning of the game so as long as you have the money you can buy anything, unlike Monopoly in which you must first land on what you want to buy. This choice brings some strategy to the game. The fronts and backs of the Establishment and Landmark cards. To build your magnificent engine, you must decide how to spend your money. Do you go with the lower value cards which always pay out income when activated, or do you go with some of the higher value cards which may earn you a lot of money, but which may also cost you money if another player rolls well? Do you go with a combination of both? Do you want to try to put together cards which may lead to some great combos, but which may also fail to pan out if the dice don’t go your way? It’s not unlike setting up a diversified investment portfolio. How much risk are you willing to take in your holdings versus the potential rewards? The other thing you must consider is when it’s to your advantage to roll two dice per turn and when you should stick to only one. In the early going, you can only roll one die. But once you build your train station, you can choose to roll either one or two dice per turn. However, if you choose to roll two you must sum the numbers. You can’t roll a five and a two and then decide you only want the two. You have to take the seven that you rolled. You not only must consider the potential benefit or harm to yourself, but also take a look at what your opponents are doing. (And it’s easy to see what they’re doing because all of the cards are face up on the table and all information is open.) Will rolling two dice give you more ability to hurt them, or will it give them more of a chance to hurt you? What are you risking if you roll two dice and it doesn’t go your way? Together with collecting the right cards, the dice choice adds more decision making to the game than you find in most fillers. Not all is perfect in the town of Machi Koro, however. Unfortunately, there are some strategies which work better than others and, as long as the dice break your way, will almost always win the game. Experienced players will likely suss these out and use them to hammer inexperienced players into the ground. A player using a great strategy who rolls lucky for a couple of turns will quickly run away with the game, leaving the others with no way to catch back up. The coins and dice of Machi Koro. There is a lot of luck in this game as almost everything that happens is determined by the roll of the dice. Whether you earn or lose money is determined by what you or another player rolls, so it’s not even just your own luck that you’re relying upon. This can lead to some hurt feelings if you’re playing with people who are sensitive to this sort of thing. Even though it happens to everyone, it can still feel mean to lose all of your money just because the yahoo at the end of the table is rolling hot. Most people take it well, but those who hate any sort of take-that in their games will get upset. The good news is that the game is short enough that it’s not the kind of luck-fest that leads to a lot of anger. If you lose, it’s not like you spent hours on a game that just came down to the roll of the dice. There’s very little AP and turns move fast. Because it plays so fast, the game scores high on the “let’s go again” meter. You just know that your luck is going to turn around in the next game, so the quest for vengeance leads to playing many games in a row. It’s not unusual to start out playing Machi Koro as a filler only to discover that the whole night has been spent on this one game. The components of Machi Koro are adequate, although nothing stellar. The cards are good quality and since there is no shuffling, they should endure for many, many games without sleeves. 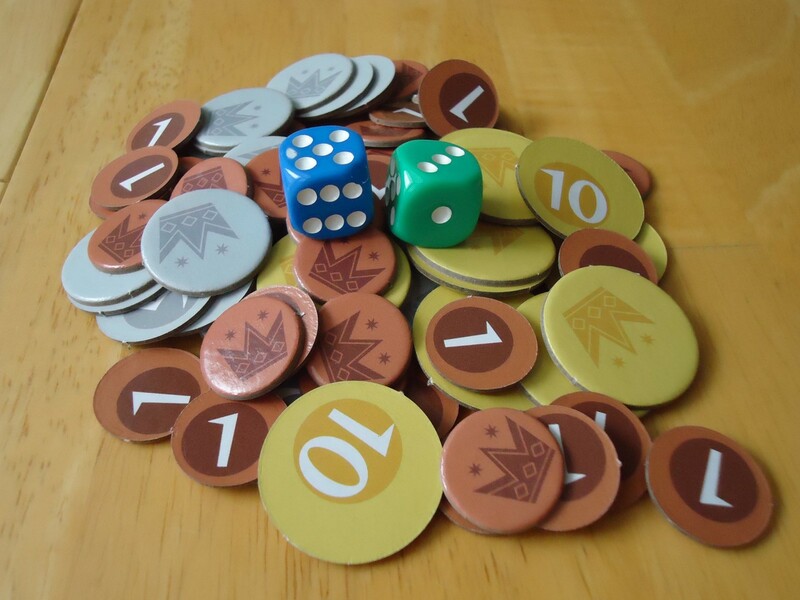 The tokens are standard cardboard, although I have seen a few people trick out their games with metal coins, real money, or even plastic gems. Doesn’t change the gameplay, but it’s fun to do if Machi Koro is played often. The artwork is cute and for some reason always reminds me of the “It’s a Small World” ride at Disney World. It creates an inoffensive, breezy theme that appeals to almost everyone (minus the annoying song, of course). And speaking of theme, yes it’s pretty loosely pasted on compared to other building-type games. You’re not actually building a city as in Suburbia or Alhambra. It doesn’t matter which establishments you place next to each other. And you’re not assembling a building as in Asara. Machi Koro is more abstract than those types of games, but for the fast playing, light type of game that it is, it works just fine. You get a sense of building a city, even if you’re not actually assembling components. Some of the Establishments in the game. Machi Koro came out of the gate as the new darling of the gaming world. To some extent, that hype was justified. It’s a solid gateway game and a good filler that shines in the family/light gaming setting. It combines some old mechanics in new and interesting ways which appeals to some gamers who are tired of the same old mechanics showing up in fillers and light games. However, it’s definitely not for everyone. Some people find it too dependent on luck and the dominant strategy/runaway leader problem can kill it for people who play it seriously. Others seem to think it should be heavier than it is and are disappointed when they find out it’s a light romp. Personally I really enjoy it, but I’m not one who takes my games very seriously. I’m usually just looking for a breezy good time, especially when I pull out a game like this, and I don’t spend a lot of time figuring out which strategy will win the game every time. This is a game we pull out on weeknights when we don’t have a lot of time or when we have family over. It’s not a game I break out when I want to really challenge my brain. I like the artwork and the feeling of having built a little something when the game is finished, even if I don’t have a real city to show for it. I don’t mind the luck, either, but then again I find dice to be a great equalizer in games, not something to be avoided like the plague. I’ve noticed that Machi Koro either evokes love or hate in players. There’s not a lot of middle ground so unless you know for sure that this is the type of game that you’ll enjoy, I would recommend trying before buying. If you’re up for a light, cute game and you’re playing in the family setting, it’s a great game. Those looking for a heavy, brain burning game with no luck whatsoever should look elsewhere. The gaming mega store was a promotional Establishment available in the first English print run of the game. Cute, charming artwork, reminiscent of It's a Small World. Quick playing, high on the "play again" meter, easy to learn and teach. Good for families and non-gamers. All information is open and all Establishments are available, so a degree of planning is possible. Great lure to get Monopoly lovers away from that game. Short play time feels right for the level of randomness in the game. As what you can do (and what gets done to you) is determined by the die roll, luck is heavily involved. If one player rolls really lucky for a couple of turns, they can run away with the game. Experienced players can develop a strategy that will win more often than not. Losing money simply because of a die roll that went against you can feel mean.